Used for treating peptic and gastric ulcers. May reduce severity of acid reflux, gastric pain and nausea. Licorice has been successfully used for around a century to treat peptic and gastric ulcers. Extract of deglycyrrinised licorice root, or DGL, offers the benefits of whole licorice but without the side effects of glycyrrhinic acid (hypertension, oedema or headaches). Licorice has properties which increase production of prostaglandins in endothelial cells in the stomach, resulting in a cytoprotective effect on gastric mucosa. Animal studies suggest that it reduces the inflammatory response which leads to ulcer formation, by inhibiting the production of inflammatory molecules such as interleukins or tumour necrosing factor. It also has an antioxidant effect which contributes to its efficacy. - contains various flavonoids that inhibit growth of Helicobacter pylori, including that of strains resistant to the antibiotics amoxycillin and clarithromycin. As a result, scientists recommend DGL as a preventive agent against peptic ulcer or gastric cancer in subjects infected with Helicobacter pylori. Other ingredients: Sorbitol, tricalcic phosphate, magnesium stearate, silicon dioxide, orange flavouring. Each tablet contains 500 mg of extract of deglycyrrinised licorice root (DGL). 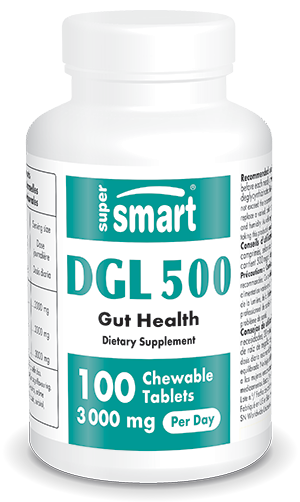 Recommended use: DGL tablets should be chewed as it is activated by enzymes in saliva increasing its beneficial effects. Chew one or two tablets, as required, 20 minutes before each meal.